IT emerged this week that shortage of water treatment chemicals has triggered a crisis in Harare and the capital now hopes to be rescued by Higherlife Foundation. According to their own profile, Higherlife Foundation is a social impact organisation that invests in human capital to build thriving individuals, communities and sustainable livelihoods. It was founded by Strive and Tsitsi Masiyiwa in 1996 and is expected to provide the required foreign currency for Harare to purchase chemicals. Council revealed during the week that they have exhausted supplies of liquid and granular aluminium, lime and HTH while only 25 cubic metres of aluminium sulphate remains in stock. During interviews with senior council officials this week, plans are there for Harare to acquire three mobile treatment plants, pumps for Morton Jaffray Treatment Plant and the Prince Edward Plant. H-Metro attended a tour of Morton Jaffray on Monday. According to the grand plan, one of the treatment plants will be at Upper Manyame and take care of the high density suburbs like Highfield, Budiriro, Mufakose, Glen View and Glen Norah. The second plant is set for Gletwyn Dam, which will then service the elite suburbs like Glen Lorne, Glenwood and Shawasha Hills. All things being equal, the third plant is designated for Mazowe Dam where it is expected to cater for such areas like Mt Pleasant, Arundel, Vainona, Borrowdale, Hatcliffe and Avondale. Acting director of water works at Morton Jaffray, Berner Moyo said there is approximately eight different chemicals used to purify Harare water and all of them are imported. “The challenge is on chemicals which cannot be accessed locally and are expensive. “The only source of chemical which we get from the country is supplied from Sable chemicals. “Water purification process is the most expensive compared to transporting the water from our main source, which is Lake Chivero,” he said. ZINWA person presenter, Peter Mhofu explained how Harare residents are facing water challenges. “The currently available water in the lake can at least manage to sustain the whole city for about two to three years if no rains are experienced. “Harare water crisis is mostly caused by the shortage of equipment and chemicals from the water works, which supply the rest of the city. “Distribution of water pipes is causing water shortages since they cannot channel water to all places in Harare, leaving some areas facing water scarcity,” he said. Lake Chivero supplies raw water to the water works which then purifies it for distribution and however shortages of equipment from Morton Jaffray is leading to the current water crisis in Harare. Assistant representative from water bailiff, a Mukurutangwa believes the rising population is affecting water supplies. “Population is now higher than water (reserves), Harare is expanding every day and water demand is very high, our source is becoming insufficient. “This year we have experienced drought, we have had insufficient rains and it’s also contributing to water shortages affecting the country,” he said. Then there is the problem of siltation, being the pollution of water by dead plants or materials dominated by silt or clay and referring to both the increased concentration of suspended sediments and often caused by soil erosion or sediment spill. “Siltation is about 14metres and it affects water level which will lead in the water shortages. 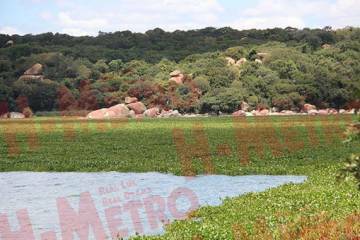 “It affects the content of water in the dam, currently the Northern side of Lake Chivero is affected by siltation. “The dam usually spills on the 18th of January up to April, May but this year there have been no spill at all,” he added. Apart from evaporation affecting the water level, weeds also contribute to the contamination of water as it changes the colour and make the water purification process complicated.